Amazon has announced that its digital books, Kindle eBooks , have started to outsell print books for the first time, and the company expects that trend to continue. 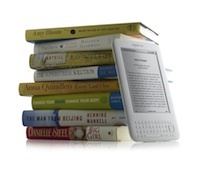 For every 100 print books sold, the company is now selling 105 Kindle books. These figures include sales of both hardcover and paperback books for which no kindle edition is available. Free ebooks were not included in the figures. If they had been, the balance would have been tipped even more toward digital books. Kindle books began outselling hardcover books on Amazon back in July 2010, and then paperback books in December 2010. Amazon has said it has sold three times as many digital books so far this year than it did for the same period last year. In case you were wondering, it has been found that digital books are greener overall than print books, and more specifically, if you are a regular book reader, Kindle has been found to have a lower carbon footprint that print books. If you’re a regular book reader, have you made the switch to digital books yet, or are you sticking with paper books for the time being?